Brandy is the face of all the old dogs suffering in shelters, left to live out the rest of their days on concrete, if they’re lucky! Most of them are killed within days of surrender. We love our Brandy Boo. She is old and crabby and obstinate and doesn’t really seem to love us back that much. Brandy was dumped at an Ohio animal shelter by her human family at the age of 15. She had a skin condition and severe arthritis. Instead of treating her medical conditions – her “family” wanted to euthanize her. Thankfully the vet saw potential for Brandy and began her on a course of treatment that began to heal her skin and allowed her to move more freely. 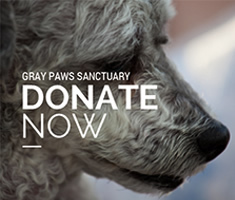 Brandy joined the Gray Paws pack on November 23, 2013. We consider her our mascot – in a way – because she was the first to arrive after we submitted our Gray Paws Incorporation papers. Brandy is getting very gimpy in her old age – now 17. Her fur and skin are fabulous – and she never had another issue with those after joining us! But she has a difficult time going from laying to standing – and that seems to worsen with every passing week now. She struggles to go in and out of the doggie door more often than not. It’s not uncommon for her to lose her footing – despite all of the rubber mats we have down – and to see her gently slump to the floor. We rush to help her and she usually pulls herself back up quickly with little assistance from us – if any. She doesn’t really play with the other dogs – never did – and pretty much just lies in her door-less crate in front of the fan and takes slow walks out onto the deck when she feels the urge. Brandy used to be able to go down the deck steps and walk in the grass. Just this spring I helped her down the ramp from the front porch into the yard and carried her back up the steps several times. She used to sleep on a crib mattress in our bedroom with us. Those days are long gone. Brandy will look at the ramp or the steps and she knows better than to attempt them. She is on the highest dose possible of her arthritis medication – without killing her internal organs. Many might think – why are you keeping her alive? What quality of life does she have? The truth is – we are not just keeping her alive. She is determined to live! She does have quality of life! She is also keeping us alive with her determined spirit that is such an inspiration to us! From the day she came home she resisted physical affection. She seemed to only tolerate it in a way. A few pets on the head and strokes along her back and she would shrug it off and reposition herself to look right into our eyes. As if she were saying – I don’t need you. It was never a mean look. It was – and is – a smart and proud look. She has NEVER had an accident in the house. She has NEVER chewed anything she wasn’t allowed to have. She has NEVER missed a meal! She loves her food! When the pack runs to the kitchen at treat time – she is trailing behind gimping along barking her head off! As we plan to relocate into a new one story space – we keep saying, “we hope Brandy Boo lives to see it.” It would be awesome for her to be able walk in the grass every day – to be able to go throughout the house and sleep in our bedroom again – not just on the first floor like she does now. Hopefully she will live a few more years to experience those things. We always selfishly hope that when one of our babies leaves us – it will be gently in the night as they sleep. But we all know that just doesn’t happen often. We will continue to watch her and love her – even if it’s at her paws length. When she’s not enjoying her naps – we will know. When she doesn’t seem to want treats – we will know. When she really needs our help to get up off the floor and looks unhappy about it – we will know. And when she finally looks deeply into my eyes some day and I see the light and the pride fading – I will know its time (this is part of the Sanctuary that Joey can’t endure) and I will help her to The Bridge – and we will see her again someday – because we know. We love our Brandy Boo…. Our beautiful Brandy Boo went to The Bridge yesterday morning. She had been having some major issues for a few weeks with her mobility. She was still getting around but not very well. Finally on Saturday, September 19th she collapsed in the entryway. She involuntarily (and probably very unhappily) peed herself and panted. She seized a bit and was immobile for quite a while. She did NOT seem to be in pain. This tough girl ultimately seemed to shake it off. She made it back to her crate with assistance and recovered well enough to eat a little bit for dinner and drink water. Sunday the same thing happened but it was worse. She would not take any food and barely drank water. We made the decision to help her to the The Bridge the next morning so that she would not eventually have an episode that caused pain. Our vet was schedule to arrive at 9:30. We woke at 6:30 and Brandy Boo walked through the dining room to the doggie door. She just couldn’t make it and collapsed in the bathroom. I laid with her and held her and told her it was ok to go. Many people might think I am crazy but I swear she heard me and she let herself leave us. She relaxed and seemed to let go. It seemed to be a gentle passing that only took about 10 minutes. Even in her death – she took control. It was as if she were saying – “I don’t need you to do this either! I got this”. Rest in peace, Boo Boo. I look forward to seeing you again – and maybe you will let me hold you? ? But probably not – and that’s ok too. Cause we love our Brandy Boo.